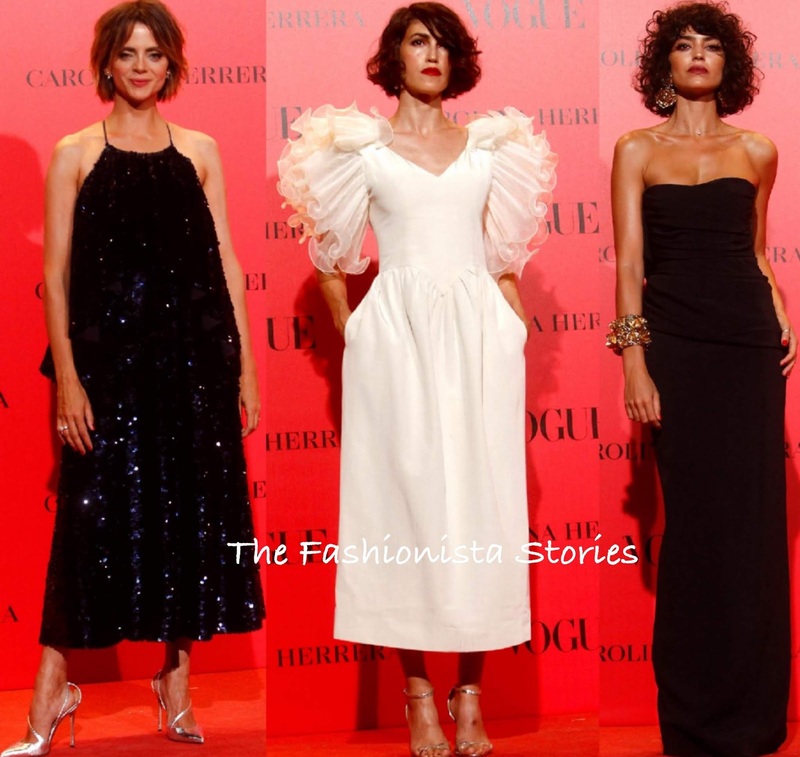 Yesterday evening(July 12th) in Madrid, Spain, the Vogue Spain 30th Anniversary party took place at La Casa de Velazquez. The event was in collaboration with CAROLINA HERRERA and most of the guest were wearing dresses by the designer unless otherwise stated. Karlie Kloss dipped into the designer's archives and snagged this FALL 2002 gold & black sequin coat dress. While I do like it, it looks a little too tight on Karlie but it is a great look for her. Also it was shown on the runway with a belt which did it justice. Nieves Alvarez looked divine in a RESORT 2018 in a one-shoulder leopard midi dress with side pockets which she utilized. She accessorized her look perfectly with a PHILIP TREACY hat and gold AQUAZZURA sandals which topped off her look. Kylie Minogue opted for a green EMILIO DE LA MORENA SPRING 2018 ruffle tier mini dress which she teamed with gold sandals. Side swept tresses and statement earrings topped off her great look. Manuela Valsco was another standout in this SPRING 2018 white/cornflower embroidered confetti dress with a flared skirt and contrasting black straps. She coordinated her look nicely with a color-block clutch and red sandals which topped off her look along with a colored lip & ponytail. Marta Hazas also wore a SPRING 2018 look. Her black strapless, bustier gown featured a belted waist, zebra printed hem and a full train in the back. Off-the-shoulder tresses and a colored lip finished up her look. Ursula Corbero took a different approach, rocking a BALMAIN RESORT 2019 sequin embroidered & feather mini dress which she teamed with RENE CAOVILLA sandals. The dress is very busy but on tune with her style and I am on board with her edgy, beauty look. Macarena Gomez sparkled in a MULBERRY navy sequin calf length halter dress with a draped, crisscross strap back. A layered cut, MONTBLANC earrings and metallic heels finished up her look. Nerea Barros is also on my favorites list wearing this STELLA MCCARTNEY white calf length dress with ruffle, layered sleeves and side pockets which she utilized. JIMMY CHOO sandals, red lips and side parted short curls finished up her look. Cecilia Gomez kept it simple in a black DSQUARED2 column dress. It was her statement DANIEL ESPINOSA jewelry which added interesting details to her look. Red lips and curly locks finished up her look. Bar Refaeli wore a black ISABEL MARANT FALL 2018 sparkly, velvet dotted mini dress with leg-o-mutton sleeves. Keeping the styling simple, she finished up with minimal make-up and black pumps. Eugenia Silva worked a ATELIER VERSACE FALL 2017 black & gold sequin embellished one-shoulder dress with a contrasting pleated panel, a split detail and train in the back. Instead of wearing a ankle strap sandal, she opted for MANOLO BLAHNIK pumps. Gold jewelry and a ponytail finished up her look. Irina Shayk wore the ISABEL MARANT FALL 2018 'Tizy' purple funnel neck dress with puffy sleeves and a ruched, draped skirt. While I do like this dress, it worked better on the runway. A small printed tote and matching purple sandals finished up her look. Goya Toledo was indeed the best dress at the event imo wearing this RESORT 2019 strapless lilac & black polka dot layered gown. You may that Brie Larson wore it in a different color & shorter length in June 2018. BARCENA earrings and off-the-shoulder tresses finished up her look.